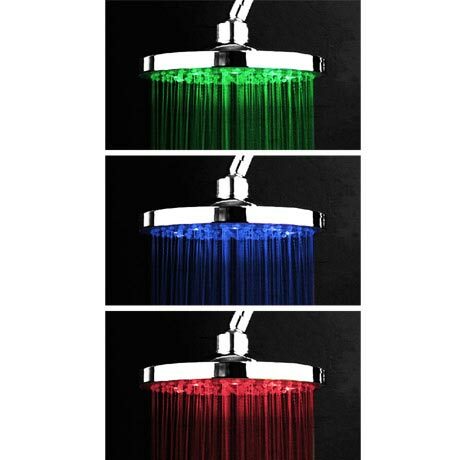 The modern Cruze round LED chrome finish shower head with swivel ball joint, lights up in three different colours dependent on the temperature of the water. Manufactured from durable corrosion resistance chrome plated plastic. No batteries are needed as the LED shower head is self-powered by the force of running water. when water temperature is above 46°C red and blue colour will flash immediately and simultaneously, which warns you should be careful. "Very happy with shower head, arrived on time, great price." Purchased this to replace the original head that had started to look grubby and ineffective.This head was ordered as a suitable replacement. We are delighted with the quality of the item which arrived the next day, the lights are excellent to indicate how hot or cold the water is, what an awesome idea. Shower gives a good spread of water and an excellent force (but this may be due to our pump).Highly recommend this item and also this company. Well done. "Order on line , arrived quickly, just what we had order , you'd price." Provides an excellent shower experience and the lights add a special touch. I am ordering another one for a family member who has seen mine. My shower cubicle was dark and the rain shower head was a trickle or a deluge depending on where you stood. Googled and found this shower head...FAST delivery, TOP QUALITY unit . Now a shower is a SPA like experience!!! Colours show true temperature and warns (blinking LEDS) when water is too hot AND the water cascades just like a TRUE SHOWER!!! Switch off the shower room's lights and ENJOY!!! Fantastic and THANKS!! !